E. J. Gunter & W. J. Chen, 2010. This paper deals with the stability and nonlinear dynamical analysis of a class of turbocharger used on locomotives and marine diesel engines. These larger sized turbochargers operate at 30,000 RPM and use floating ring bearings. The floating ring bearing is very common for use in the smaller highspeed automotive engines. The use of floating ring bearings for the heavier turbochargers can encounter a number of difficulties which can lead to catastrophic failure of the impeller and shaft, depending upon operating conditions and clearance values of the bearings. All turbochargers mounted in floating ring bearings are inherently unstable with limit cycle whirling. The whirl orbits are controlled by the nonlinear bearing forces generated in the inner and outer fluid films of the bearings. Depending upon the floating ring bearing clearances, a sufficiently high whirl motion can occur, causing the compressor impeller to rub, leading to impeller and shaft failure. A very tight internal compressor bearing ring clearance may cause the bushing to freeze to the shaft. When this occurs the bushing acts as a large clearance journal bearing and is violently unstable. The ensuing large amplitude whirl motion leads to rapid turbocharger failure. Dynamical models are presented to show the nonlinear behavior of the turbocharger and the magnitudes of the limit cycle whirl motion with both the floating bush bearing and various multi-lobed bearing designs. Attempts to make a multilobed bearing out of a floating bush bearing by adding axial grooves is not effective and may actually lead to larger whirl orbits. Improvements in turbocharger reliability with floating bush bearings may be obtained by the use of closely controlled bearing ring clearances, use of a synthetic lubricant, secondary turbocharger oil filtration, turbocharger overspeed controls, and increased radial clearances in the turbocharger inducer and compressor sections. 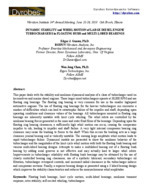 Finally, a superior bearing design is presented using a 3 lobed bearing design which improves the stability characteristics and reduces the nonsynchronous whirl amplitudes.